Eight miles. Two powerhouses. 92 years. Nine national championships. Thirty-six ACC tournament championships. A 38-37 head to head matchup favoring Duke before Wednesday night. College basketball doesn’t get much better than this. On Wednesday night, Duke and Carolina lived up to the hype – and then some – in an epic matchup that will go down as one of the best games in the history of this storied rivalry. And what a game it was. Duke executed its offense to perfection for much of the first half, scoring at a torrid pace while keeping UNC at bay. Tyler Zeller seemed like the only Heel interested in scoring, carrying the load on offense while characters like Harrison Barnes remained completely invisible. Just as our good friend Shane over at Grantland put it– it was beautiful, but it was also terrifying. Obviously we weren’t expected to win this game. But to be playing this well – or rather, shooting this well – was completely unexpected. Had the night that we had all been waiting for – the night where Duke finally puts it all together – finally arrived? Yes and no. In a blur of a finish in the first half, Carolina somehow managed to lead by three at the half. Mental errors, miscues, and a few missed shots gave UNC a small window of opportunity, and they capitalized. Momentum was on their side. Duke needed to recover, and recover fast. Conventional logic would imply that the result of the game would depend on how Duke started the second half. But of course, this was Duke and Carolina. Conventional logic doesn’t always apply. Prince Harrison Barnes woke up from his game-long slumber and the combination of Henson and Zeller absolutely dominated the glass. 45-40. Then 50-42. Another Barnes layup made it 54-44. The Dean Dome was electric, the crowd amped up, and the Heels were on fire. Prince Harry and Austin traded baskets (threes, for the most part) but Duke was going to need one hell of a defensive effort to get back into this thing. Those stops didn’t seem to come. For the better part of ten game minutes, Duke and Carolina traded baskets, the lead fluctuating from eight to twelve, Duke unable to make a dent in what seemed like an insurmountable lead. With 5:29 left in the half, Kendall Marshall drove into the lane and connected with freshman James Michael McAdoo for an emphatic dunk. 77-66. The nail in the coffin. This one was going to hurt (hell, it already hurt) – because we had played so damn well. Fast forward to the 2:30 mark in the second half. Coming out of a Carolina time out, K ran a play to get Ryan Kelly open at the top of the key. Airball. But wait – the refs rule that Henson had tipped the ball – and Duke would get another chance at chipping away at the 82-72 deficit. To relive these final two minutes, check out the incredible video put together by @DukeBluePlanet on what was to become quite the comeback. Tyler Thornton, the unsung hero of Maui, spots up for a three. 82-75. We had cut it down to seven before, only to give up another basket on the other end. But out of nowhere, Mason Plumlee somehow ends up with the ball. He gets the ball to Tyler, who throws the ball over Ryan Kelly’s head – what the hell is going on? Boom. Seth Curry drains a three. 82-78. We’ve got a ball game. Now, more than ever, we need a stop. Duke fans everywhere – including myself – are willing to barter anything with the basketball gods. And they deliver. Barnes drives into the lane, one-on-four, and Ryan draws a huge charge. Schadenfreude. The next trip down the floor, Ryan is feeling it – but his three attempt hits the back rim. Henson grabs the long rebound – WAIT. Ryan gets his own board and realizes that no UNC player makes an attempt to defend him. He buries the 15-footer. 82-80. And now the crowd is back into it. They go to Zeller on the next play – as they should have done all game – who draws a cheap foul on Mase. Somehow he bricks the first – and now we can taste it. He drills the second, but Duke has the ball and all the time in the world. 83-80. The play is designed for Kelly, whose errant three is somehow tipped in by Zeller. It’s ruled a two. One of the most bizarre things I’ve ever seen in a basketball game – especially since Zeller had no reason to touch the ball. 83-82. Zeller is fouled immediately and heads to the line. He makes the first. Misses the second, and Mason comes down with the board. He looks to get the ball to one person and one person only: Austin Rivers. He brings the ball up, calling for a Mason Plumlee screen. He moves to his right, drawing Zeller off the switch. Rivers with the jabstep. Zeller backs away, anticipating a drive towards the basket. What is he doing? He’s taking too long. This is unreal. Seth is in the right corner, screaming, “Go! Go! Go!” as the seconds tick away. One dribble, and he sets his feet. Disbelief. Shock. Confusion. Elation. Pure, unadulterated joy. All in one moment. Zero. Game over. A collective roar of victory resounds through the grounds of East and West campuses. The celebrations in the Dean Dome and on the Main Quad begin. Legendary is really the only way to describe it. Benches burned, illicitly, of course, on East campus, as freshmen experiencing their first win over UNC. 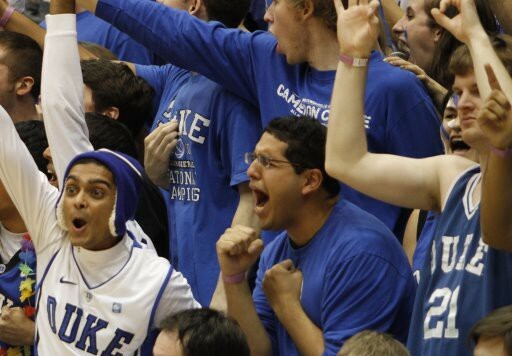 But they quickly make their way over to West, where the recently maligned Cameron Crazies have gathered to revel and celebrate their beloved Blue Devils. This party quickly makes its way to Cameron, as word spreads that the team will make their triumphant return just past midnight. Austin received quite the warm welcome as he made his way through the raucous crowd. He’s been called selfish, arrogant, and cocky. But on this night, he’s all smiles – celebrating with his team on what he called the “best day of his life”. Coach K has been vocal about this team this season, especially their inconsistent effort, poor defense, and the lack of a true leader. Wednesday night was a huge step in the right direction. They fought, they defended against one of the best teams and the country, and most importantly, they played their hearts out. Austin became a Duke legend – and grew into the leader that this team truly needs. Of course, this team still has a great deal of work to do to become a contender for a Final Four, but we can always talk about that later. Right now, this win feels pretty damn good. “incredible video,” indeed! good soundtrack pick, too!